Both natural (e.g., snapping shrimp) and anthropogenic(e.g., shipping noise) sound sources can increase the level of background or ambient noise in the environment. Masking occurs when noise interferes with a marine animal’s ability to hear a sound of interest. The significance of the masking effect is influenced by the amount of time that the noise is present and its level. Just as it can be difficult to hear someone talking at a loud party, elevated noise levels may mask important sounds for marine animals. This is of particular concern to marine fishes when the noise is at frequencies similar to those of biologically important signals, such as mating calls (for more information on frequency ranges of underwater sounds, please see What are common underwater sounds?). Low frequency anthropogenic noise below 1 kHz overlaps with the hearing range and sounds produced by most fish species and may cause masking. Coral reefs are especially noisy due to high densities of shrimps, urchins, fishes, and other organisms. Image credit: NOAA. Many fish species produce sounds (for more information see How do fish produce sounds?). For example, fishes may vocalize during spawning aggregations and courtship interactions. Problems with detection and recognition due to the presence of anthropogenic noise could therefore have impacts on reproductive successSlabbekoorn, H., Bouton, N., van Opzeeland, I., Coers, A., ten Cate, C., & Popper, A. N. (2010). A noisy spring: The impact of globally rising underwater sound levels on fish. Trends in Ecology & Evolution, 25(7), 419–427. https://doi.org/10.1016/j.tree.2010.04.005. Masking could lead to a reduction in detection distance, the distance at which a biologically significant signal is detected, or signals may be detected, but important information in the signals may get lost. In the presence of ferryboat noise, hearing of the Lusitanian toadfish, a coastal, bottom-dwelling fish, was masked at multiple frequenciesVasconcelos, R. O., Amorim, M. C. P., & Ladich, F. (2007). Effects of ship noise on the detectability of communication signals in the Lusitanian toadfish. Journal of Experimental Biology, 210(12), 2104–2112. https://doi.org/10.1242/jeb.004317. Ship noise also appeared to interfere with the fish being able to acoustically detect other members of their species. Nesting males produce characteristic boatwhistle calls to attract females for mating. The ability of females to detect nesting males may therefore be restricted in the presence of shipping noise. The life history of most coral reef fishes includes a pelagic larval stage that undergoes metamorphosis to the juvenile stage. Late stage larvae and transforming juveniles need to seek out suitable reef habitats. There is evidence that underwater reef sounds can be detected by the coral reef fish (and invertebrate) larvae guiding them to coastal areas and allowing them to identify suitable settlement habitatsKennedy, E. V., Holderied, M. W., Mair, J. M., Guzman, H. M., & Simpson, S. D. (2010). Spatial patterns in reef-generated noise relate to habitats and communities: Evidence from a Panamanian case study. Journal of Experimental Marine Biology and Ecology, 395(1–2), 85–92. https://doi.org/10.1016/j.jembe.2010.08.017Mann, D., Casper, B., Boyle, K., & Tricas, T. (2007). On the attraction of larval fishes to reef sounds. Marine Ecology Progress Series, 338, 307–310. https://doi.org/10.3354/meps338307Simpson, S., Meekan, M., McCauley, R., & Jeffs, A. (2004). Attraction of settlement-stage coral reef fishes to reef noise. Marine Ecology Progress Series, 276, 263–268. https://doi.org/10.3354/meps276263Simpson, S. D., Meekan, M. G., Larsen, N. J., McCauley, R. D., & Jeffs, A. (2010). Behavioral plasticity in larval reef fish: orientation is influenced by recent acoustic experiences. Behavioral Ecology, 21(5), 1098–1105. https://doi.org/10.1093/beheco/arq117Simpson, S. D., Radford, A. N., Tickle, E. J., Meekan, M. G., & Jeffs, A. G. (2011). Adaptive avoidance of reef noise. PLoS ONE, 6(2), e16625. https://doi.org/10.1371/journal.pone.0016625. 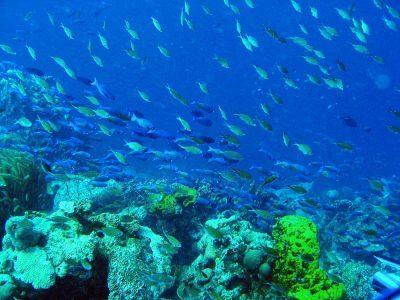 If anthropogenic sounds on coral reefs mask natural sounds, and if larval fishes use acoustic cues to find suitable reef habitats, then coral reef fish populations may be negatively impacted. More research is needed on the hearing abilities of early life history stages of fishes and the physical and special characteristics of natural reef sounds to which fish may be attracted. Tavolg, W. N. (1967). Masked auditory thresholds in teleost fishes. In W. N. Tavolga (Ed. ), Marine Bioacoustics, Vol. 2. Pergamon Press, Oxford.